PhotoBulk is an application for editing pictures in a bulk, it enables you to watermark, optimize, rename, resize and convert any number of pictures in one go.Set WatermarkWith PhotoBulk you can choose to add a text, image, script or date stamp, adjust various settings and angle under which your watermark is displayed. Protect your copyright with handy and simple single-click editor.Resize picturesResizing images is a much required option - whether you need to upload it on a web-site or email it, we usually have to fit a particular size. PhotoBulk allows to scale image to a particular size or by a certain percentage.Optimize imagesPNG and JPEG images can be optimized to load faster or meet requirements of certain websites. Decreasing the size of an image does not affect their quality or resolution.RenameGiving your images readable names is the easiest way to organize your library. 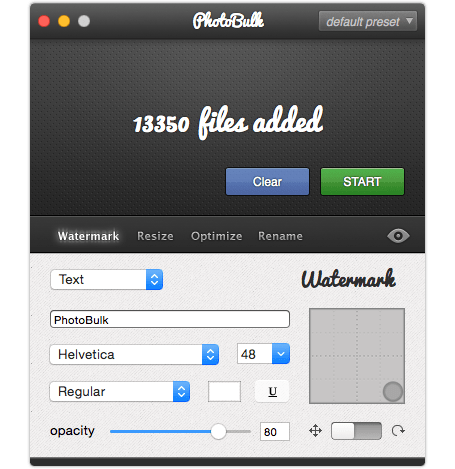 PhotoBulk allows you to give your pictures not only new names, but set file sequences anew.ConvertSome apps and sites require your images to be in certain formats. PhotoBulk can convert a large number of them into PNG, JPG, JPEG or TIFF format and create GIF files. Stitch single row/multiple rows images into 360 degree spherical and cylindrical panoramas, and export Flash VR, QuickTime VR and Java based virtual tour. Support normal lens, wide angle lens and fisheye lens, HDR and camera RAW.